It is not November. I usually tally up the dividend checks I received in the previous month. I have received paychecks from the following companies listed in the table below across all my brokerage accounts. The dividends received this month was a record high. The dividend engine is churning! 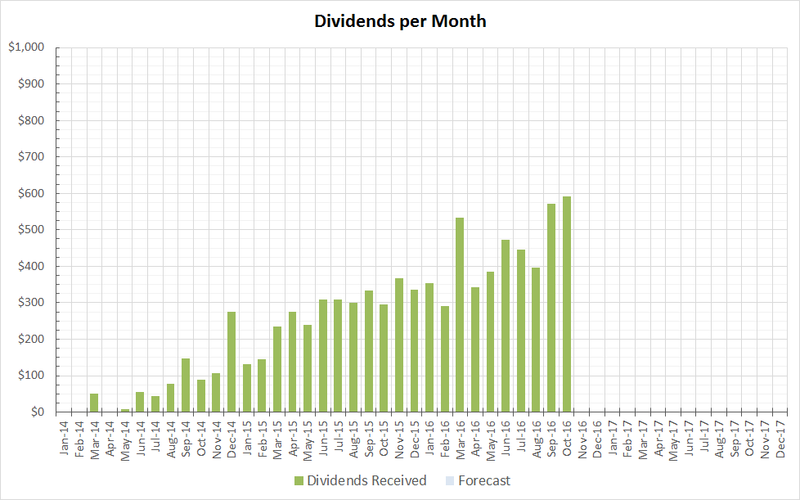 In the coming months my dividends for particular months will be much less than other months, so the bar graphs will fluctuate more going forward. This is because I rebalanced my portfolio and have more concentration of dividend payers in certain months. However, I expect that the monthly moving average of dividends paid will continue to increase steadily over time. The biggest payer was Altria and Philip Morris this month. Thank you MO and PM. congrats on your October passive income! I like your table which show taxable or IRA account. I need to make one for myself as well! THanks for sharing. Nice job for October. That's a pretty serious chunk of change that can already cover quite a few monthly bills. A lot of solid names in common paying us for the month. That's always nice to see. Thanks for sharing. Impressive numbers YD! And I think it didn't even recorded your last big Altria purchase (ex day was 9/13)? Unfortunately I didn't even received a penny in October. So this report is a nice reference to look up interesting October/July/... dividend paying stocks. Thank you! Your graph looks AWESOME. Look at that growth!